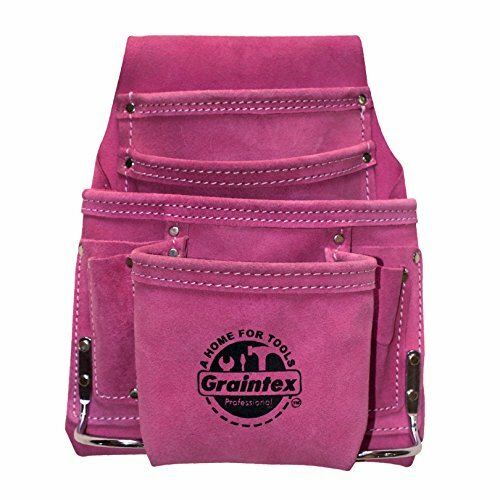 Graintex pink color leather tools pouch has 4 main pockets and 6 small pockets. The tool pouch comes with 2 metal hammer holders. The tool pouch is double stitched at all stress points for extra strength. 2 main and 2 medium pockets for nails/tools etc. If you have any questions about this product by Graintex, contact us by completing and submitting the form below. If you are looking for a specif part number, please include it with your message. Premium Jumper Cable Bag-WATERPROOFED Material Utility Bag, Multi-Use: Jumper Cable Storage Bag, Utility Bag for Car, Truck, ATV, Electric Cable Bag, Garden Hose or Shoe Bag. Perfect Gift!